A Cornish inn and restaurant has transformed a neglected, overgrown garden into a spectacular decked terrace with exotic plants, walkways, ponds and waterfalls. The Waterwheel Inn, which offers bed and breakfast accomodation, a restaurant and bar in the historic White River valley near St Austell, is creating an idyllic outdoor space as part of the property’s ten-year renovation. Owners Mark and Francesca took over the Waterwheel Inn in April 2011 and are giving the outdoor space an ambitious makeover as part of a ten-year project. They had assumed that timber decking would not be a viable option for the new terrace, which sits under mature plants and trees in a shaded valley and would become very wet and slippery. The couple were researching safer rubber flooring options when they discovered Gripsure – the UK’s leading non-slip decking manufacturer, based just three miles away. Made from FSC-approved Scandinavian Redwood timber, Gripsure decking gives the warm, natural look and feel of traditional decking but its nonslip aggregate strips ensure it stays safe, even in wet weather. The owners opted for Pro Classic, Gripsure’s original design, which achieves the highest safety rating of any nonslip decking available on the market. The Waterwheel now has a five-by-eighteen-metre decked terrace, with a number of walkways around the garden in development. The owners are also improving disability access points with decked ramps into the property and in and around the garden. 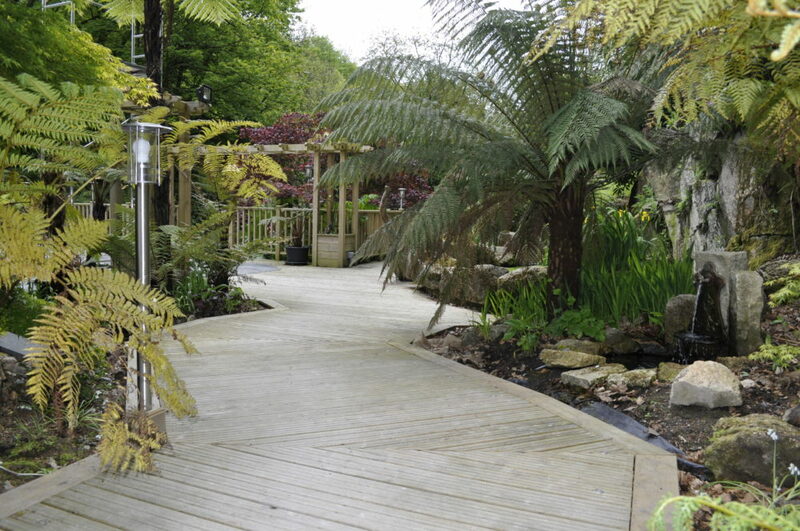 The garden gives guests the opportunity to enjoy the mild climate of mid-Cornwall as well as appreciating the owners’ extensive collection of tree ferns and observing local wildlife. With the venue already proving popular for private functions, the owners are now in the process of getting a ‘grant of approval’ to hold civil marriages and civil partnerships. Mark Willis said: “When we took over the business, it had been on the market for four years, so the garden was really overgrown, with horrible old crazy paving and a falling-down pergula. It needed a huge amount of clearing but we knew there was potential for this to become a real asset to the business: somewhere tranquil for guests to relax over a their morning coffee, or enjoy a family meal on a summer’s evening. Gripsure Director Mike Nicholson said: “Business owners often tell us that they had assumed timber decking was not an option for them, until they saw our products. It is very rewarding when we help them achieve beautiful timber decking that offers them the safety they need.